The Karst Shepherd is a medium sized, compact sheepdog, of iron-grey color with a 10 cm long dense, double coat. The head is extremely noble with friendly, almond-shaped, dark-brown eyes and an amiable, rounded skull. It is slightly longer than its height, with a sabre-like tail that reaches at least to the hocks. The back is solid, straight; the chest of medium width and elbow deep with quite well-sprung ribs. Teeth: scissor-bite, dentition perfect. The iron grey color has two additional shades, toward silver grey or very dark grey. Some of the darker animals have characteristic stripes on the legs, a reminder of their ancestry. The Karst Shepherd is a very specific and extremely reliable breed. As a sheepdog it is independent and brave, but also prudent and reliable with a very stable temperament. This is a very dominant breed and should only be owned by people who truly understand what that means. Proper human to canine communication is essential. The objective in training this dog is to achieve pack leader status. 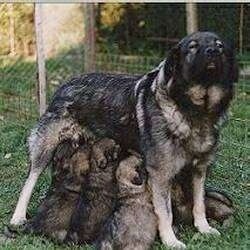 It is a natural instinct for a dog to have an order in its pack. When we humans live with dogs, we become their pack. The entire pack cooperates under a single leader. Lines are clearly defined and rules are set. Because adog communicates his displeasure with growling and eventually biting, all other humans MUST be higher up in the order than the dog. The humans must be the ones making the decisions, not the dogs. That is the only way your relationship with your dog can be a complete success. Timely and correct training is crucial. In general, the Karst Shepherd is a reliable and independent guard dog, and is an excellent sheepdog. The Karst Shepherd is not recommended for apartment life. It needs space and will do best with at least a large yard. Because its thick coat protects it so well, it can happily cope with living outdoors provided it has proper shelter. This breed of dog is best suited to a family with lots of space surrounding the home. It should be taken on daily, long, brisk walk or jog. While out on the walk the dog must be made to heel beside or behind the person holding the lead, as in a dog's mind the leader leads the way, and that leader needs to be the human. The Karst Shepherd is a Slovenian natural treasure and the oldest indigenous breed. It was internationally recognized in 1939 as the Illyrian Shepherd and then again under the current name of “Krasevec” in 1968. The breed is several centuries old and has been used as the sheepdog in the Slovenian Karst area mainly around Pivka. The ancestors of the Karst Shepherd were described by internationally renowned explorer Prof. Strebel as a link between the Greek Molos and the German Shepherd. He mentions the possibility of a Latin origin via the Pompeii dog. However, it is more likely that it was brought to the Karst area by the Illyrians with their sheep herds via the Dalmatian islands and Istra. The Greek Molos interbred with other sheepdog breeds in the wider area, such as the Caucasian and Romanian sheepdogs or the Macedonian sheepdog or Sarplaninec. The Karst Shepherd has long been regarded as a good flock guard and remains so even today when, like most working dogs, it is more of a companion and friendly family member. The fact that over 100 Karst Shepherds have won one or several titles as nominees, national or international champions, and that 50 have passed the service dog exams testifies that the Karst Shepherd is an established and quality breed. Together with the four breeds of hounds, the Karst Shepherd is part of a rich natural and national heritage and dog-breeding tradition, which in 2005 was celebrating its 76th anniversary of organized operation in the Slovenian Kennel Club.